Users are unable to create new registry keys if they are not local administrators. This is a problem incase you have feautres which need to create their own application log categories or similar. This leads to an error being thrown and the feature is not activated. This problem was fixed by editing the registry. Click Start, click Run, type regedit in the Open box, and then click OK. The Registry Editor window appears. 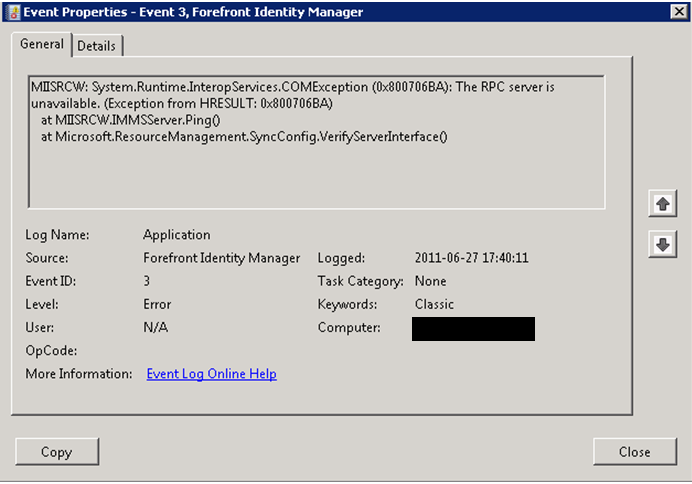 Right-click Eventlog, and then click Permissions. The Permissions for Eventlog dialog box appears. Click Advanced. The Advanced Security Settings for Eventlog dialog box appears. In the Name column, double-click the Users group. The Permission Entry for Eventlog dialog box appears. Select the Set Value check box, select the Create Subkey check box, and then click OK. The first step here is to add the icon for the PDF files. You do not need to do this step if you do not wish to add the icon to your SharePoint environment. We then need to add this icon to SharePoint. pdf” Value=”pdficon_small.png” /> The value here is simply the name of the pdf icon file (the standard name is pdficon_small.png) you can change this if needed. Now we have told SharePoint to look for the image pdficon_small.png when it finds a PDF document so the last thing we need to do is to actually add the image somewhere where SharePoint can find it. Open \14\TEMPLATE\IMAGES\ and simply add the pdficon_small.png to that folder. Now that we have the icon for PDF files setup we need to add the actual iFilter which our crawl will use. The iFilter is now installed on the server but we still need to tell SharePoint to use it. It is worth to mention that there are commerical iFilters as well that will crawl your files much faster. The free iFilter from adobe will only crawl one PDF at the time so if you are experiencing problems with the time it takes to crawl your farm due to there being a lot of PDF files you might want to look into the iFilters you can buy for PDF. Save the file, the error should be gone now. The configuration database is a small database (1GB or less) the transaction logs are however likely to grow quickly due to the amount of changes that take place. It needs to be read a lot but does not require to be written to as much. The database contains data about the SharePoint farm; it is what the entire farm relies on for general settings relating to databases, IIS web applications, site templates, web applications, default quotas etc. Scaling Scale up. Only one Configuration database per farm is allowed. Default recovery model Full. It’s recommended to set the configuration database to simple recovery to restrict the growth of the log file. The Central Administration Content is a small database (1GB or less) if you do however use Power Pivot it will grow more. It stores information about all site content, meaning all documents and files, list data, web part properties. It also host all information about user accounts, service accounts etc. It has varying read/write characteristics meaning that we cannot determine if it’s more read or write intensive. Size information Small (1GB or less). If Power Pivot is used it will grow larger. Scaling Any content database which is hosting a site collection must be scaled up as we cannot split a site collection across two databases. It is however recommended to create new site collections in the same web application with their own Databases as the recommended size of a database is 200GB. If a Content database is hosting multiple site collections it is recommended to move the site collections to their own databases. Location requirements This is a very active database that should be put on a separate disk if possible. Size information Extra-large (1TB or more). The size depends on retention time and amount of objects being monitored. Scaling To usage and health must scale up as only one logging database is allowed per farm. Size information Small (1GB or less) depends on amount of connections. The state database stores temporary state information for InfoPath, chart web parts and the Visio service. Size information Medium (100GB). The size is determined by the number of reports being generated. Scaling Scale out. Add additional staging databases with the service application instance. The reporting database stores the aggregated report tables, fact data from group sites, date and asset metadata, and diagnostics information for the web analytics service. Size information Extra-Large (1TB or more). The size is determined by the retention policy of the data. This database hosts the search service application configuration and access control list (ACL) and the “best bets” for the crawl component. This database is accessed for every user and administrative action. Location Requirements The administrative database should fit into the RAM on the server so that it can handle the end-user query load as efficiently as possible. The Administration and Crawl databases should not be located on the same server. Size information Small – Medium (1GB – 100GB) The size is determined by the amount of best bets, the number of content sources and crawl rules, the security descriptions for the corpus and the amount of traffic. Scaling The database must be scaled up. Additional instances can be created but each instance can only host one database. The crawl database stores the state of the crawled data and the crawl history. In large scale environments it is recommended to run the crawl database on a server that is uses SQL 2008 Enterprise edition so that the data compression can be used. Scaling Scale out. Associate another crawl database with the service application instance. Multiple Crawl databases can be placed on the same server as long as it can handle the I/O per second required. The property database stores information that is associated with the crawled data, including properties, history and crawl queues. In larger deployments it’s recommended to use a SQL 2008 Enterprise server so that data compression can be used. Location requirements At least one-third of the Property database should fit into the RAM on the Server. In large-scale deployments its recommended to this database is hosted on its own server to achieve faster query results. Size information Large – Extra Large (1TB or more). The size is determined by the amount of managed properties and the number of documents. Scaling Scale out. Connect another property database with the service application. Each additional property database should be hosted on a different server. The profile database stores and manages all users and information associated with the users. It also stores information about the user’s social network and memberships for sites and lists. Size information Medium – Large (100GB – 1TB) Determined by number of users, the use of news feed, retention time. Scaling Scale up. Additional instances of the service application can be created but generally because of business not size. The database stores the configuration and staging data for use when profile data is being synchronized with the active directory. Size information Medium – Large (100GB – 1TB). Grows with more users and groups. The social tagging database stores social tags and notes created by users, as well as their urls. Size information Small – Large (1GB – 1TB). Grows when additional tags, ratings and notes are created and used. The managed metadata database stores the managed metadata and the syndicated content types. You can change the third line depending on if you want the dashboard to be always on, off or on demand. If it is on demand the user has to press the developer dashboard icon in the top right corner to enable the dashboard for that given page. If your event log shows errors relating to the RPC Server being unavailable (COM Exception 0x800706BA, Event ID 3), like the one below. 2.Make sure that they are running. (You could also try to restart the services if they are running and you still get the same error). Starting/restarting these should solve the problem. This error is generally due to the fact that the Search service application cannot write to the usage and health database. The Execute method of job definition Microsoft.Office.Server.Search.Monitoring.HealthStatUpdateJobDefinition (ID 9cb6be54-0384-4c6e-abfc-c2f25621a3ed) threw an exception. More information is included below. Could not find stored procedure ‘dbo.Search_GetRecentStats’. Unknown SQL Exception 2812 occurred. Additional error information from SQL Server is included below. This is most likely either because the usage and health service does not have Health Data collection enabled. Go to central admin and under monitoring select Configure usage and health data collection. Select both the Enable usage data collection and the Enable health data collection. Then perform an IISReset and restart the SPTimerV4 service.